Watch THIS VIDEO with your families! It is one of the coolest things I've ever seen! It is two hours long, but every second is full of AWESOME!!!! @Hanna_Brassheart and the rest of you who can't get on Youtube, ask your parents if you can watch it on another, unrestricted device WITH THEM. To find it, search "The Exodus presented by Jim, Penny, and kids". I do believe the world is going to end, but the thing is we have souls, and our souls live forever. I totally agree @Ilayne_Merespark. So IMO the world and universe end (Bible says the "old will pass away") but we also know that in the end-end we will live on New Earth, forevahhh! Wow @Gloria_Oldenpinner! Really nice job there. I'll give you a warning, you could get banned for mentioning Christianity. I know, that seems bad. It is bad. But they have a rule where you're not supposed to talk about religion their. The only thing you can basically do is post scriptures in your bio and hashtags and such. It's a bad world we live in. I'm glad we have a safe, great website like the forums where we can talk about God. Just be careful on KA. @Jacoby_Elderfun1 Speaking of that, I posted a Christian comment on the topic of evolution on KA... it got deleted and I got a private message from the moderator. So yeah, just proving your point. Thank you @Hanna_Brassheart @Jacoby_Elderfun1 @Ilayne_Merespark. Yep, souls ain't gonna die. That made me laugh. Though don't take it personally but I think you went a bit too far with the second last post. I find that whenever I bombard someone with stuff like that, they're definitely not going to listen to you anymore. Non-Christians especially don't like Christians who are sassy. Remember that our job is to bring as many souls as possible to heaven, not prove that someone else is wrong. To all of you religious people who think that god is the best, and would forgive him. I have a question. Say god is this great pure being, and does no evil... Why would he send people who are misguided into not believing in him to be tortured for all eternity? You would forgive him? "Because he created us!" is not a good reason. Say you gave birth to a child, and tortured it all of it's life, would you expect it to forgive you because "you created it!"? I find all of the "facts" on here to be false. Why would you trust a book from 600 AD or multiple long documents from the past 100 years with lots of proof? Of course a sensible person would choose the new, proven research. Welcome to the forums! We are happy to answer all these important questions. Could you explain a little more? I don't think I fully understand. Why would he send people who are misguided into not believing in him to be tortured for all eternity? Can you elaborate on this? Do you mean, "Why doesn't God save everyone?" or, "Why doesn't God show Himself and prove Himself so everyone believes?" What do you mean by forgive God? Why would you trust a book from 600 AD or multiple long documents from the past 100 years with lots of proof? Of course a sensible person would choose the new, proven research. If you want to believe that the Bible is a fabricated book (even though archaeology says otherwise), okay. But how do you explain all of the specific (not vague) prophecies being fulfilled to this day? What new proof are you referring to? Hey @RYAN_SCHROCK, welcome to the forums! Great question, I've sometimes wondered that myself. He doesn't make them not believe, everyone has a choice whether to follow him or not. He created everyone in the entire world, so he has the right to do whatever he wants with us. And yes, I do believe that God does no evil. He can't. Say you gave birth to a child, and tortured it all of it's life, would you expect it to forgive you because "you created it!"? God doesn't torture us, it's sin. Sin came into the world through Satan, not God. What ever happens to a person, sin is responsible for. God would never torture you because he loves you. Why would you trust a book from 600 AD or multiple long documents from the past 100 years with lots of proof? Because that book is all truth - just because it's old doesn't mean it's not true. Also, Christianity is based on faith - we BELIEVE that it is true. Without faith, Christianity is dead. The first quote, I mean why does god send people to hell for not believing in him? I honestly cannot explain the prophecies. And I'm talking about the proof of evolution. In the beginning of the world, the first humans, Adam and Eve, lived in the Garden of Eden. They were perfect, no sickness, no death, it was perfection. So what happened? Satan, the Deceiver, tempted Eve in the garden to do that one thing she was forbidden to do... eat the fruit of the tree of Knowledge of Good and Evil. Eve ate it, then gave some to Adam, and he ate it. That was the first sin, and Satan's first victory. Because of sin, death happened. Degeneration happened. Sickness happened. Basically everything that was perfect was now not. Because of that, we need Jesus's gift, or else we cannot be with God, who is perfect. We cannot. Hell is punishment for sins committed. Jesus came to save us, but we must accept him into our hearts. 1. The gravity on earth is diminishing rapidly and has halved in the last 2,000 years meaning that 6,000 years ago (when God created the heavens and the earth) you would have weighed around 2 to 3 times what you weigh today, but seeing as people were healthy because of the great weight they could manage that with little difficulty because a person would average 250-300 pounds on average, you would be much stronger, however, go back to 10,000 to 20,000 years ago when homo sapiens were supposedly evolving then you would have weighed between 500-1,500 lbs which would if not killed most people then, would have killed any life before then. How could evolution work under these circumstances. 2. Can you prove the Oort Cloud? 3. Could you please find me good chart showing every proven link between Lucy and Homo sapiens. 4. If evolution is based on the survival of the fittest then how can you call it wrong if I killed people weaker than me? 5. Giraffes have valves in their necks that close when they bend down to drink water, if that valve was not there then the giraffe would pass out because of an excessive amount of blood rushing to the brain and would fall into the water and drown. The ancestor that giraffes evolved from did not have this valve, how did the giraffe evolve in this case because half evolved giraffes could not have been able to drink. 6. Give me proof that the Bible lies. ahem Parents do not create their children. God makes them in mommies' tummies using a process you either already know about or will learn when you get older. And no, no I would not. I know how hard it is to forgive my parents when they wrong me. But God is not my parents. I know from experience that he is not them. God is loving and merciful and kind, while my parents sometimes haven't been that way. Do you believe that God has wronged you? If people are wronging you and saying they are doing it because God told them to do it, it has nothing to do with God, it has to do with them. In view of that, I would like to roll with your parent analogy. We're the kids that want to drink the drain cleaner God tells us (like any good parent) not to drink. There's also not anything wrong with drain cleaner - when it's used to unclog drains, that is. But we keep drinking the stuff, and every time we do God rushes us off to the hospital to save us. But you see, no matter how many times the parents medically intervene, eventually if you persist in drinking drain cleaner, you will die. Sin is like that - we cut ourselves off from the infinite sustaining power of God we need and decided to rebel against infinite power. But we live this insanity every day, and we don't realize just how deep it has a hold on us - until we try to fight it. Worse, we've grown really crafty in our drain cleaner addiction. We hide it in our squeeze bottles, we buy more of it, we borrow it from our friends, we build entire corporations and governments to make sure everyone else is drinking drain cleaner too, therefore no one will question our right to drink poison, because they are doing it too! If you think that is in insane, sin is even more insane. God is walking into that drain-cleaner drinking world and saying "Hey guys, anyone want some orange juice?" "It tastes better, and it's actually good for you." Of course a sensible person would choose the new, proven research. This is a chronological fallacy. When a particular truth is discovered has no bearing on whether it is true or not. God has been telling us the truth and the devil has been trying to deceive us since the beginning of time. But let's bring that home a little bit. Consider a car accident. Let's say you're standing on the side of the road and three cars hit each other. An angry driver who is having more than a bad day T-bones a passenger car with her F-150, slamming it into a nearby wall. Meanwhile, another guy coming the other direction hits this mess with his 4 Runner. The F-150 gal drives away to avoid getting caught. You see all of this. Later on, the forensic guys come along and collect the evidence. They conclude the passenger car driver lost control and slammed into the wall, and the 4-Runner hit the passenger car, thus blaming the driver of that car, who is conveniently (for them) now dead. The police report will reflect this conclusion - and it doesn't reflect on the forensic guys, who no doubt think they are right and have evidence for their conclusions. But they aren't fooling you. You KNOW what happened. You saw it. The same thing is true of the Genesis creation story versus the evolution story. The evolution story is the "forensic guys" coming along after the fact and collecting the evidence and drawing their own conclusions. But they aren't going to fool Adam - he was there. They aren't going to fool Moses either, who was there. Or David, who was there. Or Jesus' followers - they were there. You can argue that the oral tradition of the creation story got distorted between Adam and Moses, but when Moses wrote down the law, I think God would have corrected any errors in the Genesis story. Various parts of that creation story are cited in the entire Bible as God's reasons for doing what he does, his promises in the past, etc. The entire Bible is internally consistent, despite the fact that it took place over a period of thousands of years. That alone is a witness to its accuracy. I see that you've already got a few replies to your questions, but I hope you won't mind one more. I would recommend checking out Lee Strobel's The Case for a Creator and The Case for Christ, especially in the student edition as it's a more casual read. These books address evolution and Christ, and the evidence surrounding them. I found them to be very informative on current research at the time it was published, and worth a read whether you believe in God or otherwise. They lead the reader to draw their own conclusions. One more thing. I know of a really good online resource called GotQuestions. They specialize in answering questions just like those you proposed. You may find it helpful! I actually just watched that movie! Yes, it is definitely worth checking out. Also, welcome to the Aetherlight forums, @RYAN_SCHROCK! Hey, @RYAN_SCHROCK. I'm @Xonos_Darkgrate1, welcome to the Aetherlight forums. I'd love to argue with you if you're up to it. I've decided not to for now since everyone here can be a handful at times and i don't really want to add to that unless you're fine with it. In any case, I'm on "their side", but if you're up for another side to the conversation, just @ me with a request. @RYAN_SCHROCK, let’s talk about the Bible. First off, the Bible’s is even older that 600 AD, the first book of the Bible was written 3,400 years ago, the last book of the Bible was finished in around the year of our Lord (AD) or CE (if you prefer that) 80. It was then compiled by the early church fathers who underwent a painstaking process to make sure that every book was inspired by God Himself. This completed Bible was then copied by hand, the method for coping was to write each letter one at a time and if they made a single mistake they would start all over again. In 1946 the Dead Sea Scrolls were discovered in Israel, they were copies of several of the books of the Old Testament written before the time of Christ by a group of Jews who had withdrawn to the wilderness because of the Romans. Included in the writings was a copy of the book Isaiah and when compared to a modern copy of the same book there were two words different, both the differences were just spelling. Two words different in 2,000 years is amazing. The Bible has been copied more accurately over time than Aristotle’s work. 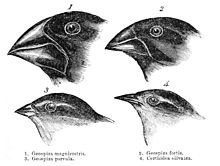 Darwin, upon visiting several locations around the world, noticed that these different types of finches, the 1. Large Ground Finch, 2. Medium Ground Finch 3. Small Tree Finch, 4. Green-warbler Finch, and declared that these finches had evolved over time. This however is in no way true, this is called adaptation, an animal or human will over generations change slightly to better aid themselves in their environment in the same way Eskimos have larger hearts to keep them warmer. These animals or humans are not however changing into new types of animal. You don’t see the Finch becoming a mammal or a reptile becoming a bird which science has always failed to prove. Radiocarbon dating is based on the belief that radiocarbon in organic things is being released at a constant rate all the time. Most evolutionary dates given to rock layers and fossils are derived using this method. 1. How do those dating the material know how much radiocarbon was in the material to begin with. 2. How do they know how fast that it has been leaking from the substance. 3. How do they know if the object hasn’t been infused with radiocarbon or put into a position where it can’t emit normal amounts of radiocarbon. As you can see radiocarbon dating is very faulty. When Mt. Saint Helens erupted on May 18, 1980 it layed down several new layers of sediment, the scientists in the area then sent samples of these new layers to the lab and they were dated the layers as being 65,000 years old! Whales were not around at the time of the dinosaurs. Whales were mammals. Mammals appeared in the late Triassic, and the pleiosaurus died out in the end of the Cretaceous, like almost all lizards, but the mammals survived. They became larger and more plentiful and therefore ruled the Cenozoic era. The first whales were land animals and appeared about 1.5 million years ago. They slowly moved to the water, and so we got the whales we have today. Short answer: Whales were not around at the time of the dinosaurs, and around the Cenozoic, they moved from the land to the water and that's how we got our whales today. @Cizzar_Ratchetsong, we don’t believe in evolution around here, so please only talk about it on this topic, if at all, so we can debate it, otherwise please refrain from mentioning it or I will debate anyway. I don’t believe in evolution myself, but being as this is an open game forum, saying “we believe thus-and-such and you have to agree” or trying to restrict what other people talk about is probably a violation of the guidelines.